If you’ve ever watched Harry Potter, you know who Marcus Flint is. 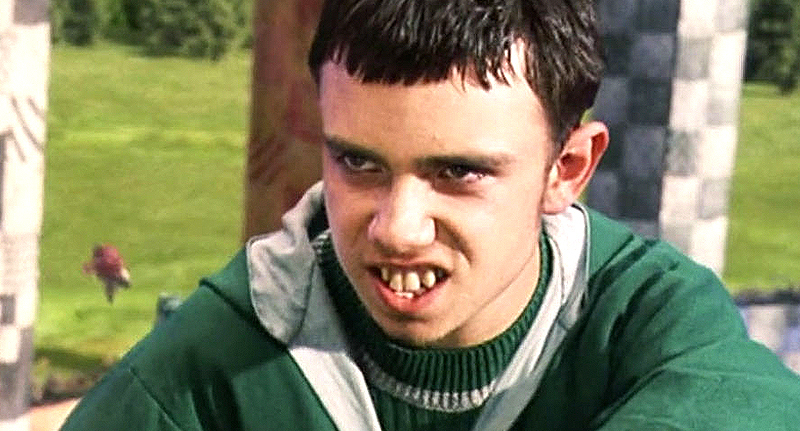 Those teeth were the stuff of nightmares for kids who watched The Chamber of Secrets – and although he was a minor character, Slytherin’s grimacing villain (played by Jamie Yeates) is not easy to forget. He had a face only a mother would love. And even as captain of his Quidditch team, Marcus Flint was never destined to have any luck with the ladies. If you walked by him today though, you’d never know. Yup, that’s Marcus Flint. And it definitely proves the Harry Potter boys do puberty right. Yeah, there’s a slight difference. While Lewis has stayed acting since his last appearance in Harry Potter, Jamie’s IMBD says he hasn’t done any acting work since appearing in The Chamber of Secrets, which he starred in when he was 18. But there are pictures of the now 32-year-old seemingly modelling on Google, so he may have ditched acting to take on the modelling industry instead. It’s not hard to see why. Think Neville Longbottom Got Hot? You Have To See What Marcus Flint Looks Like Now!